Trains have long held a special place in the imagination, reinforced through novels and movies, as settings for intrigue and romance. On a cold winter’s night, soft light illuminates the Sightseer Lounge car, where passengers converse in hushed tones as stars twinkle above; in the Dining car, strangers get to know one another over a fine meal; and Mr. or Ms. Right might happen to choose the seat next to yours. Paging through back issues of the official Amtrak employee newsletter, one comes across numerous articles detailing Amtrak romances— affectionately known as “AmRomances”: chance encounters that led to dates, proposals and even a few marriages. In honor of Valentine’s Day, we take a look back at some of the sweetest stories and catch-up with one couple. In the mid-1970s, Stella, a college student at Kentucky State University, met her future husband, Kent, aboard the Southwest Limited. 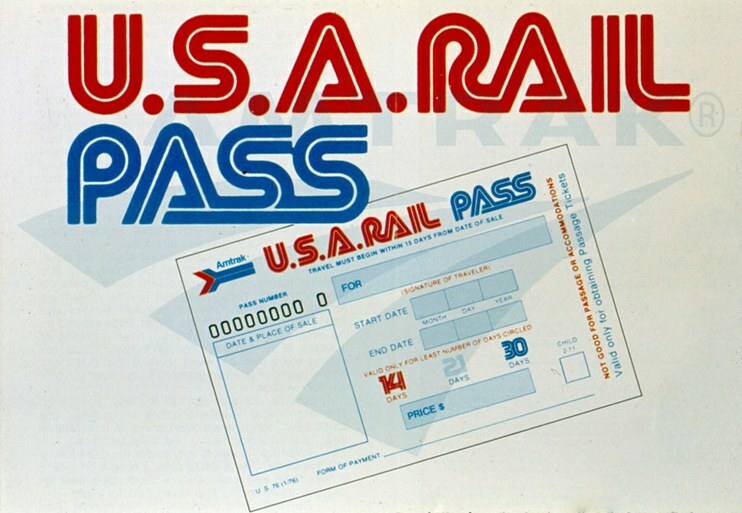 He had spent the previous few weeks exploring the country on his U.S.A. Rail Pass. As the train rolled across southwestern deserts and Kansas prairie, they decided to try a long-distance relationship via letters. A year later, they were married in Louisville. Honoring the train that brought them together, the rehearsal dinner “featured a red, white and blue Amtrak theme” that included Amtrak steins used as vases for the centerpieces, and a copy of the “Join Amtrak for a Journey into the Future” brochure for each guest. A U.S.A. Rail Pass unexpectedly helped one man find his true love. On her first train trip from New York to Philadelphia, Joanne purposely brought a book with her to deter a seat mate from striking up a conversation. In a letter to Amtrak, she noted, “I’m not unsociable but have run into many ‘characters’ in my travels.” Upon leaving Penn Station, a man took the seat next to her; although she tried to ignore him, he broke the ice by commenting on the title of her book. Before she knew it, she was engaged in conversation and plans were made to meet again for a real date. Within a year, they were contemplating a wedding on Amtrak. The depot plays its part in a number of love stories too, for it is the place where last goodbyes are whispered before the conductor calls “All Aboard!” A decade ago, a couple held their wedding reception at the historic Santa Fe depot in Norman, Okla., which has been lovingly restored by the town to serve as an arts center and events space. As the party wrapped up, the bride and groom walked out the door and across the platform to catch the northbound Heartland Flyer to Oklahoma City. hopped on the Heartland Flyer to start their honeymoon. Friends joined them on the train from Oklahoma City to Guthrie for the 45 minute trip. Once Reverend Bonner Teeter had finished the nuptials, guests enjoyed cake and champagne provided by Amtrak. Everyone then detrained at Guthrie while the newlyweds continued on to Chicago. According to R.W. Willaford of Plant City, Fla., he was “born and raised on trains…many people in my family have worked on the railroads.”1 Thus when he and his fiancée considered a venue for their December 2000 wedding, a train made perfect sense. Back in the early 1970s, Willaford and friend Marshall Johnson had both worked for the Seaboard Coast Line Railroad. Given the option of joining newly-formed Amtrak, Willaford chose to stay with the freight side while Johnson became an Amtrak conductor. Knowing his friend’s love of the railroad, Johnson suggested a ceremony aboard the Silver Star and subsequently worked to put the plan in motion. With more than 60 guests, R.W. and bride Felice boarded at Winter Haven and found the Dining car “decorated in green and white streamers, red bows and bells.” Take a look at their marriage license, and it cites “Amtrak Silver Star” as the location of the wedding; Willaford recalls the vows were uttered at milepost 832 between Haines City and Auburndale as the train glided through central Florida’s lake district. Following the ceremony, everyone enjoyed cake and hors d'oeuvres before getting off at Orlando. Asked if he would encourage others to pursue a wedding on the rails, Willaford says, “Yes…do it. Most of our friends had never heard of a train wedding, but it sure was a fun experience for everyone.” Willaford retired from CSX the year before his marriage, but he and wife Felice are frequent Amtrak travelers. When his granddaughter graduates from high school this spring, he plans on taking her on a cross country train trip to Sacramento. Over many decades, Willaford has collected a variety of railroad memorabilia— including a caboose, switcher engine, lanterns and signs. The refurbished equipment occupied his yard, and during Christmas and Easter parties hosted by the couple, children were invited to explore and ask questions. In late 2013, he donated the collection to Plant City, which has renamed its Union Station Depot Welcome Center in his honor. The historic building now serves as a railroad museum, while close by, a new train viewing platform and tower give rail fans a safe and comfortable place from which to watch freight and Amtrak trains passing through town. A week ago, the community held its inaugural Railfest to celebrate Plant City’s railroad heritage and promote safe activities around trains and tracks. A long, relaxing train trip is also a great way to celebrate an anniversary, especially for a romance that blossomed on the rails. In June 2003, Ken and Vicki spent their third anniversary aboard the Texas Eagle. Attired in a tuxedo and wedding dress, respectively, they arrived in the Dining car to find that the service attendants had decorated their table using materials at hand. Deft folds and an artistic eye transformed plain tin foil into elegant swans, while a cooking pot, with the addition of some napkins and carnations, became an ice bucket for champagne. Tomatoes in the salad were even carved into delicate roses! The story of a couple from Baring, Mo. perhaps best demonstrates how railroads are threaded into the fabric of our lives, holding memories that remain always. Floyd and Edith, married in October 1927 at the Presbyterian Parsonage in Memphis, Mo., boarded a Santa Fe train at nearby Baring on their way to a California honeymoon. bonded over coffee and eventually married. To mark their golden anniversary, they wanted to recreate that first train trip—except the Santa Fe Railway no longer operated passenger trains, and the Amtrak Southwest Limited, which used the Santa Fe tracks through town, did not stop in Baring. But upon hearing their story, Amtrak worked with the railroad to make a special stop on October 3, 1977. As a group of friends and relatives gathered at the shuttered depot to see the couple off on their west-bound journey, time must have stood still for a moment. Even in this age of social media and instant communication, old fashioned romance remains—check out the Amtrak Blog for the story of Michael and Tess, who met on an Amtrak Cascades train, connected over a cup of coffee and ended up married four years later. Do you have a story of an “AmRomance”? Share it with us! 1 R.W. Willaford. Interviewed by Amtrak History. Telephone interview, Washington, DC, February 11, 2014. All quotes by Willaford are drawn from this interview. “Amtrak Honeymoon For California Pair,” Amtrak NEWS, July 1, 1977. 5. “Golden Wedding Trip,” Amtrak NEWS, October 1, 1977. 5. “Train Romance,” Amtrak NEWS, October 1, 1977. 6. “Lone Star Wedding,” Amtrak NEWS, February 15, 1978. 7. “Amtrak Romance,” Amtrak NEWS, July 1980. 14. “Couple weds on rails,” Amtrak Ink, February 2001. 10. “Amtrak Chef Makes Meals on the Move,” Amtrak Ink, July 2003. 5, 11. “Train Whistles, Romance and Wedding Bells,” Amtrak Ink, January 2005. 10.